I hope everyone is having a great week! Today I am sharing a really simple recipe that is great for Holiday parties or just any time of the year. Typically I recommend eating raw unsalted nuts for optimal health. Most store-bought nut mixes are high in processed sugars, artificial ingredients and are incredibly high in sodium. However, if you are going to create and enjoy a nut mix for a special treat, then this is the best recipe! 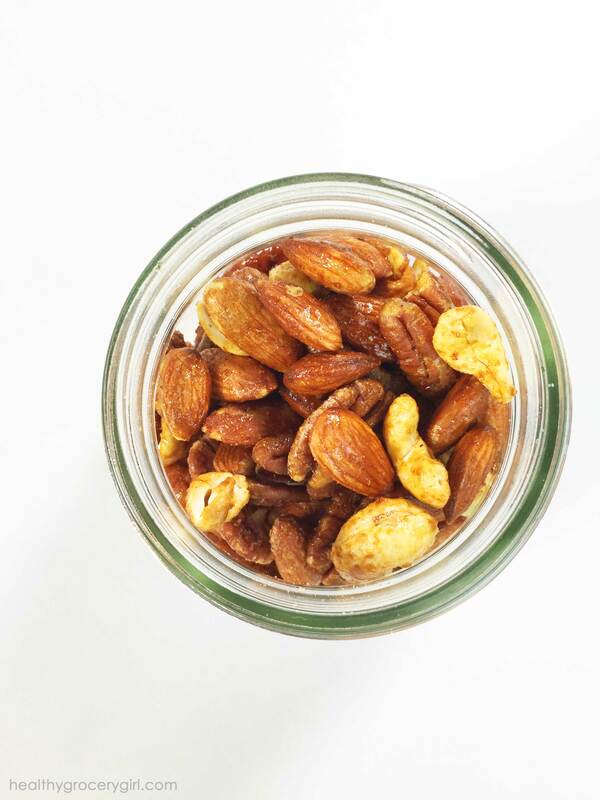 This nut mix requires just a few ingredients. You can watch the how-to video and get the recipe below! If you give this recipe a try I’d love to know. You can leave a comment below or if you snap a pic of your recipe make sure to include #HealthyGroceryGirl on social media so I can see it and like it! Happy party nut making friends…. Preheat the oven to 300 degrees Fahrenheit. Grease a baking sheet with coconut oil. Next, place nuts in a bowl and drizzle with maple syrup, and then stir together so the nuts are evenly coated. Add in ginger, curry power, coconut sugar and sea salt. Spread nuts evenly on baking sheet and bake for 12-15 minutes until nuts are toasted and sugar is browned. Give nuts a stir halfway through so they cook evenly on both sides and do not burn. Let nuts cool for a few minutes before serving. Enjoy!